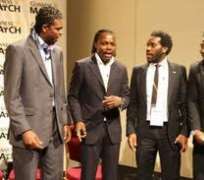 Nwankwo Kanu, former Eagles Captain, and some players of the senior national team, are upbeat that Nigeria will qualify for Brazil 2014 World Cup. In separate interviews at the U. J. Esuene Stadium, Calabar, where the team defeated the Flames of Malawi 2-0 in the Brazil 2014 qualifying match, they told the News Agency of Nigeria (NAN) that Nigeria would be in Brazil 2014. Kanu, currently Ambassador of Football, said he was glad that the team advanced to the next stage of the qualifying series and called for support from all Nigerians. 'It is our country; we cannot run away from it. We want to be in Brazil 2014 World Cup. We have to give them encouragement and motivation to win their games. 'I am an ambassador of football and I want football to keep on growing. People are always complaining that over the years, the Eagles have not playing as good as we played in our days.
' But football is coming of age; it is step-by-step and we are growing. We have to support our team,'' he said. Godfrey Oboabona, one of Eagles defenders in Saturday's match, also said that the defeat of Malawi in Calabar was what the team had always wanted to accomplish. 'It is a thing of joy; we are happy. It is what we have been praying for - to beat Malawi and top our group and be on our way to qualifying for Brazil 2014 World Cup. We are getting there. 'We thank God that everything worked out well for us. It is not over yet. We still have some qualifiers to play. Our aim is to get to the world cup and make sure we do well and make Africa proud,'' he said. 'I am not scared of anybody or team; we will take them on as they come. We are Africa champions. I am excited and happy that our team is getting to the next stage of this competition.
' I feel that my time in the national team has come. I am now starting games- a regular. But I have to justify this by doing my best and playing in the first team,'' he said. Eagles Media Officer, Ben Alaiya, also spoke glowingly about the performance of the team, describing the victory as 'fantastic for the Super Eagles.
' I thought we should have scored them five or six goals. We outplayed them in all departments of the game. We were the better side from beginning to the end. 'They had fantastic defending, but we were also good and dominant in our defence. It is obvious that we are true African champions and we have proved it,'' Alaiya said. Alaiya said, 'It is not only home games that we have won these days. We defeated Bafana Bafana 2-0- a better team than the Flames- at the Nelson Mandela Challenge in South Africa.